Visiting anglers on holiday in Thailand with an interest in Predator fishing now have the opportunity to fish at IT lake Monsters for what is possibly the widest selection of tropical and exotic freshwater monster fish anywhere in the world. 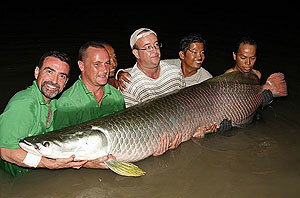 Thailand, known as ‘The land of Giants’ is home to some of the largest freshwater fish in the world. Many of these are home grown monster fish which are indigenous to the rivers and lakes of Thailand. In the last two decades there has been an explosion of a new generation of exotic freshwater monster fish species which have been introduced into Thailand by enterprising fish farming operations.With this new wave of imported freshwater monster fish species a new series of monster fishing venues has emerged offering multi species predator fishing in Thailand for discerning international anglers. The world famous IT Lake Monsters in the province of Ratchaburi in Thailand is a perfect example of this exciting new kind of predator fishing venue. It is one of the first and best fisheries in Thailand to offer anglers the opportunity to fish for both native and introduced monster freshwater fish. IT Lake Monsters is a five acre commercial fishery exclusively stocked with large monster fish species with several monster fish species present in its depths which have attained gigantic weights of over one hundred kg’s. On arrival at this highly prolific venue predator fishing fans will be amazed at the amount of monster fish which regularly show and crash about in the lake. Predator fishing in Thailand allows the visiting angler the opportunity to fish for various monster freshwater species such as the awe inspiring Arapaima or Pirarucu, Redtail Catfish, Alligator Gar, Sorubim and a whole host of other exotic freshwater predators. 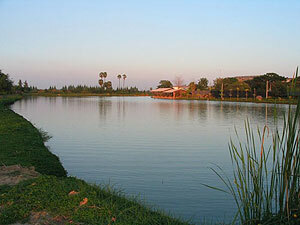 By choosing the predator fishing package at this venue in Ratchaburi, Central Thailand, anglers have the unique opportunity to fish for the various monster fish with a selection of lures, flies, deadbaits and live baits. Our predator angling package allows the visiting angler the chance to fish with lures or flies in the morning for the many predatory species and experience the intense thrill of fighting large monster fish on medium weight spinning outfits or fly fishing kit. 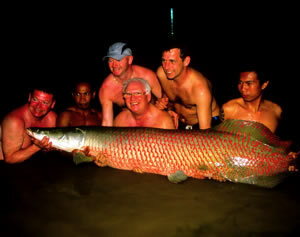 A wide variety of monster fish species can be caught whilst lure fishing at this venue with specimen sized Giant Snakehead, Barramundi, Alligator Gar and Redtail Catfish all falling to conventional lure angling techniques daily. Later in the afternoon anglers are permitted to change over to bait fishing (1 rod) with either live or dead baits which are then free lined or float fished for the predators. Productive baits for the predators include small Gold fish, Tilapia and mackerel fillets which can all produce monster fish on any given day. Predator Fishing at IT Lake Monsters for Arapaima and other monster fish could be described as being highly prolific with large mixed bags of predators caught on a daily basis by visiting anglers. Whilst predator fishing at IT Lake Monsters anglers can expect to catch between 10-30 monster fish in a single days predator angling with the chance of an extremely large monster fish such as an Arapaima or Redtail Catfish being a distinct possibility. IT Lake is open for anglers to fish between the hours of 06.00am and 18.30pm every day of the calendar year. Our daily predator angling trips to IT Lake Monsters start at 05.30am from a prearranged pick up point in Bangkok. 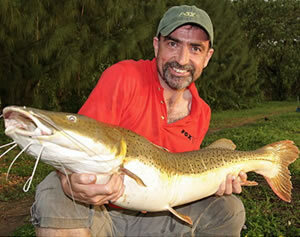 The daily itinerary for our daily predator fishing trips to IT Lake Monsters in Thailand is listed below. Predator anglers wishing to fish this predator angling mecca in Ratchaburi in search of predatory species will be collected from their Bangkok hotel by a Fishsiam representative and transported by air-conditioned minibus to the lake. The duration of the transfer to Ratchaburi is approximately two hours from central Bangkok. On arrival at this record breaking venue the angler(s) will be greeted by a scenic lake of some five acres nestled amongst lush green fields.The lake has one main structure affording the angler(s) some shade from the sun in addition to serving refreshments. The lake is ideal for lure casting and fly fishing with little surrounding vegetation to impede the angler(s) casts. In the morning (6am) the angler(s) will be equipped with all necessary lure angling equipment and a wide selection of lures in order to target the large head of predatory species that reside in this predator angler’s paradise. Specialist anglers fishing IT Monster Predator Lake can expect furious action from the numerous predators that aggressively attack lures cast into their path. Although IT Monster Lake was originally intended to be a lure fishing destination Fishsiam has gained special permission to use live baiting and dead baiting tactics after in the afternoon affording the angler(s) the chance to hook into some of the lakes larger carnivorous inhabitants. The Fishsiam team has accounted for numerous Arapaima gigas and other predatory species to an estimated 150kg using deadbait tactics from this highly prolific fishery. Whilst fishing at IT Monster Predator Lake with live/deadbait tactics this highly prolific predator venue will produce non-stop adrenaline filled action from various native and imported predatory species with double figure catches being caught on a regular basis. Throughout the days predator fishing the angler(s) will be accompanied by a Fishsiam guide who will assist with all netting, photographic and other angling requirements. In addition all live and deadbaits will be provided throughout the day. Fly fishing is also permitted at the lake and is proving to be a highly successful method. At the end of the days angling (6pm) the angler(s) will be returned by air-conditioned vehicle to your Bangkok hotel. Fishsiam offers daily expeditions to this venue in addition to weekly packages with various accommodation options. Expeditions to this venue can also be combined in our tailor made packages which are designed to meet the visiting specialist anglers specific angling requirements. 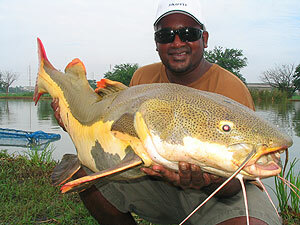 IT Lake Monsters also has a good stock of Giant Siamese Carp which are rarely fished for and exceed 50-60kgs. Anglers who do not wish to fish in the morning with lures can on request fish for the carp. An additional charge would apply in this event to cover additional bait costs. To make your booking or enquire for further details please use the button below.